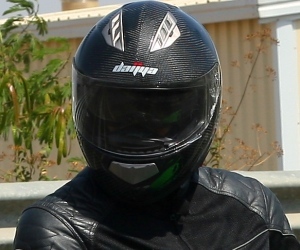 “Ride below 60 kmph till the first 1,000 Kms”. This is what is normally told while taking delivery of a new motorcycle. It is supposed to be in interest of proper “engine running in”. Even if you do not stick to proper engine running in tips, relax.. All Izz Well..!! This is actually erroneous as one can rip his bike in the first gear and still not reach 60 kmph..!! 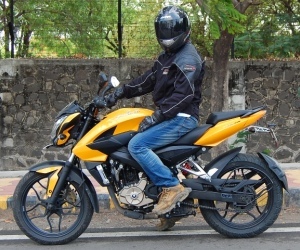 The idea basically is to take it easy on the engine and try to limit the engine rpm roughly below 4,000 in each gear (which will automatically limit the top speed at around 60 kmph). But is that the correct running in procedure? Not so long ago, I wasn’t totally clear about “what”, “why” and “how” about engine running in. Therefore I had never posted about it on my blog (I stay away from spreading half cooked info). Over the years I have tried to acquire knowledge about this and now I feel confident that I have collected decent amount of dope on it to post it here. Posted below is my attempt to explain “what” happens inside an engine, “why” engine running in is required and “how” it should be actually done. With the knowledge of what goes on inside an engine, the “do’s and don’ts” during the running in period becomes clear. Disclaimer: So far I haven’t tried to implement these running in techniques. But I promise that I will surely do it on my next bike. It’s therefore up to you to decide whether to take my “advice” or not. I maintain that I am no expert to give you bike advice; I am just a Biker Next Door. Why is running in of new engine required? An idea of the operation of a 4-stroke, petrol engine is essential to understand the running in procedure. Posted below is an attempt at such an explanation in simple terms. A. In a 4 stroke engine (lets take a single cylinder engine here) there is a piston which moves inside a cylinder in a vertical motion. This vertical motion is converted into rotational motion which is then transferred to the wheels. The surface of the cylinder of a new engine is a rough one that has a series of minute peaks and valleys cut into its surface. Such a surface is called a “cross hatched” surface. A properly run in engine will have a surface like that of a grooved file with the sharp peaks flattened and valleys which act as the oil reservoir holding oil up to the top level of the groove where it then spreads over the peak surface. The piston ring must "hydroplane" on the oil film retained by the grooves. It is therefore needed to flatten out the peaks for more surface area to support the rings, while leaving the bottom of the groove intact to hold enough engine oil to keep the surface of the cylinder wet with oil. 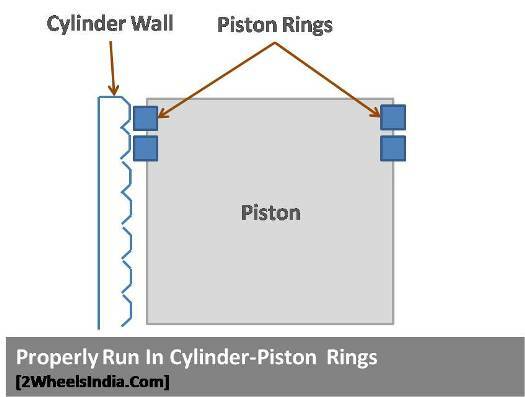 Otherwise, the piston ring would make metal-to-metal contact with the cylinder wall and the cylinder would quickly wear out. When combustion occurs, it exerts pressure on the piston rings which helps push the ring against the rough cylinder wall surface. 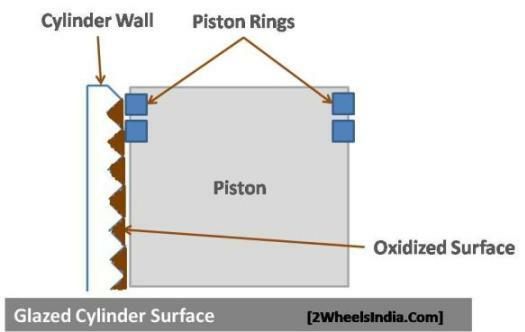 Piston rings are designed to take advantage of the pressure and use it to push the rings out against the cylinder wall. 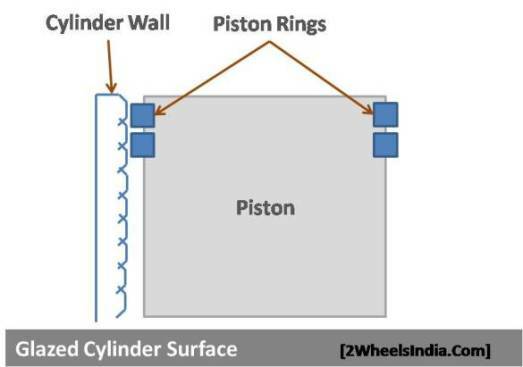 Therefore, as pressure builds during the compression stroke, the face or portion of the piston ring that interfaces with the cylinder wall rubs against the coarse surface of the cylinder wall causing wear on both objects. 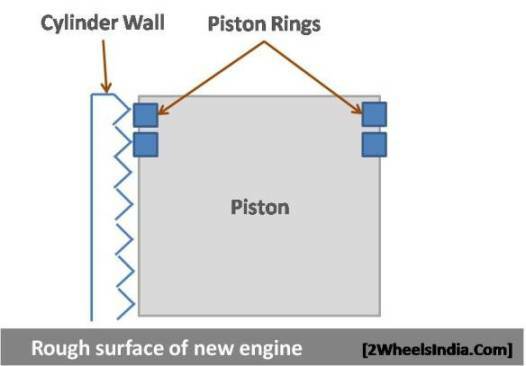 The objective of engine running in is to get the new piston rings to wear into the cylinder wall until a compatible “seal” between the two is achieved. Let’s start straight with the proper running in procedure and then try to explain them one by one. Letting the engine warm up for 1-2 minutes lets the engine oil to reach its working temperature. When cold, engine oils are not at their optimum viscosity levels. It is because of this reason why bikes have problem starting in cold climates/mornings. 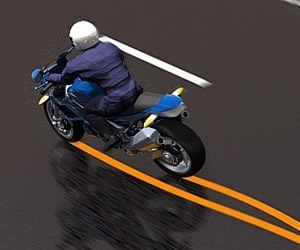 Letting the engine to warn up also ensures that the engine oil flows to all the moving parts of the bike. It is a good practice which ensures a longer engine life in the long run. During high engine revs the pressure inside the combustion chamber pushes the rings harder against the cylinder surface causing high amounts of friction and causes too much build up of heat at the cylinder wall interface, which will cause the lubricating oil to break down and glaze the cylinder wall surface. 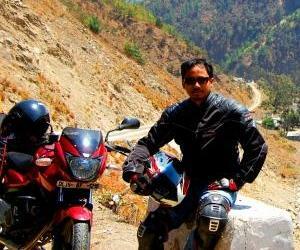 It is actually because of this reason why riding at high engine revs for sustained period of time is not recommended. Therefore to be on the safe side, it is normally told to “ride below 60 kmph”. This one came as a surprise to me. But it seems riding at low engine revs with the throttle open, especially at higher gear (called as “lugging”) is equally detrimental for a new engine. 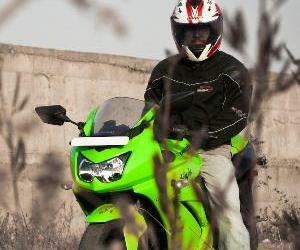 Riding at low power settings will not expand the piston rings enough, and a film of oil is left on the cylinder walls. The high temperatures in the combustion chamber will oxidize this oil film and that causes glazing of the cylinder walls. Due to the wear and tear of moving parts, a new engine heats up easily than one which has been run in. Riding over long distances / for long period’s cause’s engine heat to build up. This is not good for the running in process. In case one has to travel long distances during the running in period, give a chance for the engine to cool down when it heats up too much. During the running in period one should let the engine get used to different power settings and riding conditions. In normal language it is called “freeing up the engine” to achieve a proper seating/seal of the piston rings and the cylinder surface. It is advised not to ride at a constant speed for too long. According to what I have learnt, about 80% of the engine running in takes place within the first 50-70 kms. Similar to a battery left for charging the remaining 20% of engine running in takes place over an extended period of the remaining 900-1,000 kms. During the initial 50 kms tiny metal particles are worn off from the new engine and found accumulated floating in the engine oil. Therefore although it’s not mentioned in the owners manual it is beneficial to replace the engine oil after the first 50-100 kms. Not compulsory but after learning what happens inside a new engine, it certainly seems logical. Synthetic engine oils are too slick/slippery for use in a brand new engine. Synthetic oils do not let the engine running in to take place. Always use mineral oils during the running in period. Mineral oils have the necessary coarseness which aids the running in process. What happends when proper engine running in doesn't happen? If the piston rings do not seal/seat with the cylinder surface, hot combustion gases blow by/past the piston rings and enters the crank case. The hot gases then react with the engine oil which leads to higher consumption of engine oil. Also when a proper seal of the piston ring with the cylinder surface doesn't occur then excess amount of oil enters the combustion area which then gets burnt during the combustion process leading to excess engine oil combustion, reduced engine oil level and a smoking exhaust pipe. Even if one doesn't really pay attention to the running in procedures it is more or less ok.
Modern engines are quire well made. I mean how many new bikes/motorcycles with smoking exhaust pipes do you get to see on road..?? So even if you do not happen to stick to proper engine running in tips, relax.. All Izz Well..!! Just ride normally, do not over rev the engine for long intervals, do not over heat a new engine and never miss the scheduled service intervals.. and everything should be just fine. According to this site (click here) for a proper engine runnin in, a new engine should be revved hard in short bursts i.e to "alternate between short bursts of hard acceleration and deceleration". What is Engine Knocking, Do you really know? nice info bro........ thanx for the information . this cleared all my doubts about engine run-in. but i have a problem . i bought honda cbf stunner last year. i rip my bike from the very first day, i have not seen any any engine problem till date but i am getting a very less mileage of 35-40 kmpl at normal riding conditon(50-70kmph and engine rpm under 7000). what should i do.. please help me..? @Mazid, its not possible to comment on your bike's engine condition without checking it out. thanx for the info bro.... i wanna ask u a question that wahy my pulsar 220's faring vibrates btw 4000 & 5000 rpm ..... and its my mileage is very low about 25kmpl on ripping and if i ride it btw 60 to 75 it goes on 30 to 35kmpl thats all.... how can i increase its mileage...??? Higher engine rev = more fuel consumption = less mileage. Happens with every bike. The fairing vibrations can be fixed by putting double sided tapes/rubber inserts. thanks bro.. wish I could post more often, but I have also got a full time job + a family. Btw, what you do Payeng ? Great Post bro, Great information good work !! !